After you have placed objects in a scene, you will likely want to modify their properties to get the design just right. Torch AR makes it easy to modify the properties of objects. You can change the position, scale, rotation, visibility and color of an object. You can also spin an object or cause it to consistently face the user. When viewing or modifying the values of an object's properties it's helpful to think of these values as the object's initial properties. 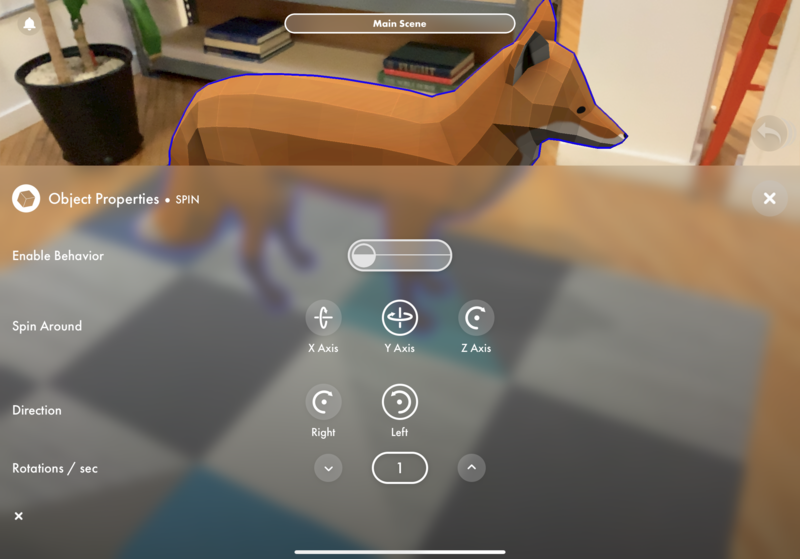 Torch AR has an interactivity feature called Interactions, that allows objects in your scene to dynamically respond to the user during Play Mode. Tap an object to select it, or enable multi-select and tap multiple objects to select them. The selected object(s) appear highlighted in blue. Tap the Object Properties (cube) icon in the context menu on the right side of the screen. The Object Properties drawer opens at the bottom of the screen. You can read about each of the object properties in the following sections. The Position object property describes the location of an object in the scene. You can use gestures to move objects whether the Object Properties drawer is open or closed. Tap any of the position fields to enter exact values. When you are satisfied with your changes, tap the check mark in the lower right to confirm, or tap the X in the lower left to cancel the changes. Tip: If you move an object with touch gestures while the Object Properties drawer is open, you will see the values in the position fields update after each gesture. The Scale object property describes the size of an object in the scene. Touch gestures are a quick and intuitive way to scale objects. You can use the two-finger pinch gesture to scale an object. When you scale an object with gestures, the object always maintains its aspect ratio. You can use gestures to scale objects whether the Object Properties drawer is open or closed. Tap any of the scale fields to enter exact values. To maintain the aspect ratio of an object, enter the same value in the X, Y, and Z fields. When you are satisfied with your changes, tap the check mark in the lower right to confirm, or tap the X in the lower left to cancel the changes. Tip: Remember that the scale property represents multiples of the object's original size. To see an object at its original size, set its scale values to X = 1, Y = 1, and Z = 1. You can tap undo afterwards. Tip: If you scale an object with touch gestures while the Object Properties drawer is open, you will see the values in the scale fields update after each gesture. The Rotation object property describes the orientation of an object in the scene. Touch gestures are a quick and intuitive way to rotate an object. You can use the two-finger twist gesture to rotate an object around its vertical axis. You can use gestures to rotate objects whether the Object Properties drawer is open or closed. Tap any of the rotation fields to enter exact values. When you are satisfied with your changes, tap the check mark in the lower right to confirm, or tap the X in the lower left to cancel the changes. Each object has its own set of X, Y, and Z axes. When you rotate an object, the object rotates around its own X, Y, and Z axes. For 3D models, an object's axes and original orientation were defined by the creator of the model. Torch assigns axes to 2D images and videos in the following way: -Z points outward from the face of the image frame, +Y points up towards the top of the image frame, and +X points towards the left of the image frame; the axes meet in the center of the image frame. For rotation values, you can enter any positive or negative angle that is expressed in degrees. If you enter a rotation angle that is greater than 180 degrees or less than -180 degrees, Torch will convert that angle to the equivalent angle between -180 degrees and 180 degrees. For example, if you enter a rotation angle of 270 degrees, Torch will convert it to -90 degrees, which is the same angle. Positive angle values rotate an object around the rotation axis in the counterclockwise direction. Negative angle values rotate an object around the rotation axis in the clockwise direction. Note: When an object is created in Torch, it is oriented with its +Y axis pointing up. Rotating an object with gestures will always rotate the object around its vertical axis (even if the object has been rotated such that it's +Y axis is no longer pointing up). Tip: If you rotate an object with touch gestures while the Object Properties drawer is open, you will see the values in the rotate fields update after each gesture. The Visibility object property specifies whether an object can be seen during Play Mode . Tap Invisible or Visible to change the visibility property of the object. When you are satisfied with your change, tap the check mark in the lower right to confirm, or tap the X in the lower left to cancel the change. The Color object property specifies the color applied to an object. When the Enable toggle is switched to the right, the color property is active and has an effect on the object. When the Enable toggle is switched to the left, the color property is disabled and has no effect on the object. The default color is red. If you enable the color property for an object and do not specify a color, the object's color will be red. The default color mode is HSL. You can specify a color in terms of hue (H), saturation (S), and lightness (L). You can also enter a color in the hexadecimal format. If you wish to use RGB (red/green/blue) instead, tap the color mode toggle (looks like two dots) in the lower center of the screen. Note: Some materials on 3D models can cause unexpected results when the color property is used. 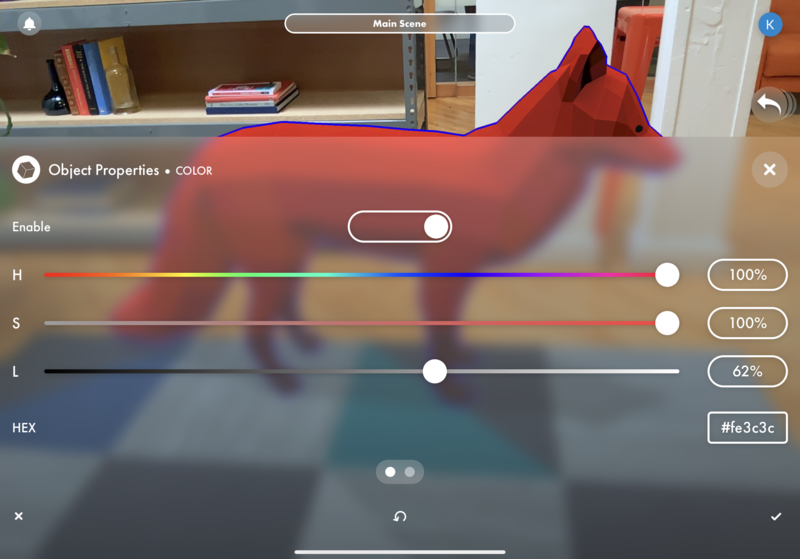 If you experience an issue using the color property with a 3D model, contact us for help: support@torch.app. Tip: If you're new to working with color in 3D design, " Color models and color spaces " by Programming Design Systems provides a good tutorial. The Spin object property is a behavior that causes the object to rotate continuously. When the Enable toggle is switched to the right, the spin behavior is active and has an effect on the object. When the Enable toggle is switched to the left, the spin behavior is disabled and has no effect on the object. When Spin is enabled, the object rotates continuously. You choose which axis it spins around (X, Y, or Z), which direction it spins (right/clockwise or left/counterclockwise), and the speed of the spin, expressed in rotations per second. Each object has its own set of X, Y, and Z axes. When you enable the spin behavior on an object, the object spins around one of its own X, Y, and Z axes. For 3D models, an object's axes were defined by the creator of the model. The Face Camera object property is a behavior that causes the object to continuously face the user. Face camera rotates the object around the specified axes in an ongoing attempt to face the user. Face camera can be especially helpful for keeping text legible on objects that are far away or at an angle to the user. 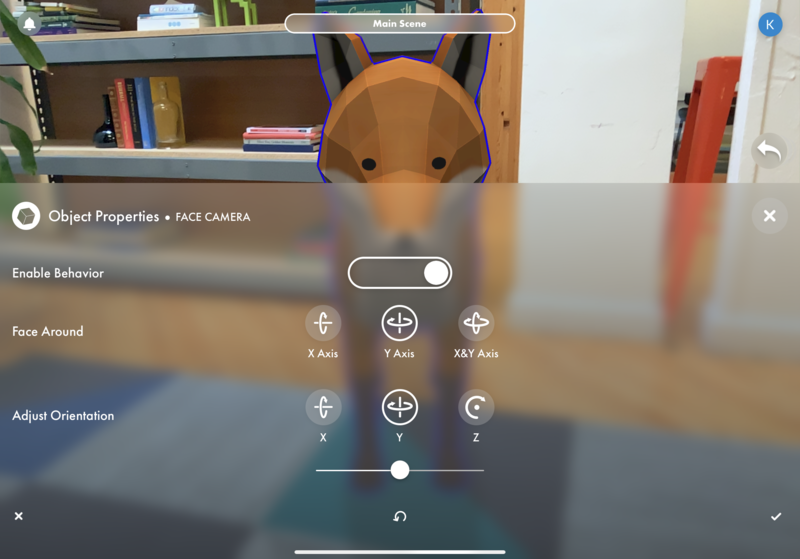 Tip: If you are using the face camera behavior, there's a good chance that you can benefit from some guidance on making the most of 2D assets in AR . When the Enable toggle is switched to the right, the face camera behavior is active and has an effect on the object. When the Enable toggle is switched to the left, the face camera behavior is disabled and has no effect on the object. X Axis: The object rotates around only the horizontal X axis to face the user. The X axis option is rarely used. Y Axis: The object rotates around only the vertical Y axis to face the user. This is a common option used with 2D images and videos. X&Y Axis: The object rotates around both the X and Y axes to face the user. As the face camera behavior is frequently used with 2D images and videos, it is helpful to know how Torch assigns axes to these objects: -Z points outward from the face of the image frame, +Y points up towards the top of the frame, and +X points towards the left of the image frame; the axes meet in the center of the image frame. For 3D models, you will likely want to use the Adjust Orientation setting to rotate the object to face you in the way that you want the object to face the user. For each of the X, Y, and Z axes, tap the axis, and then move the slider until the object faces you. Note: When multiple users are in the same scene at the same time in Play Mode , an object that has face camera enabled will face each user individually; that is, each user will experience the object facing only them.